Traditionally we think of chocolate as an indulgence and so every now and then it is a nice treat. Generally the high calories in chocolate, due to large amounts of sugar and fat, do not make it a smart option. Over-consumption of chocolate can play a role in health problems such as weight gain, cavities and caffeine-related side effects. On the other hand, several studies have found that eating dark chocolate can have positive effects on health due to high levels of flavonoids and antioxidants. Professor Saverio Stranges and colleagues examined the association of chocolate consumption with insulin resistance in 1,153 people aged 18-69 years old in Luxembourg. Insulin resistance happens when the body doesn’t react to insulin and it is a risk factor for type 2 diabetes and heart disease. 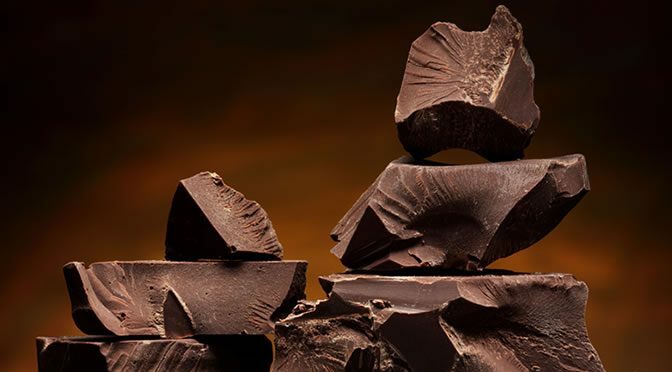 In this study 81.8% of participants claimed to eat chocolate around 24.8 grams per day and the higher the chocolate consumption, the more reduced insulin resistance and improved liver enzyme levels (they indicate inflammation or damage to cells in the liver). Also subjects who reported eating chocolate on a daily basis tended to be younger, wealthier with higher education and more physically active. The study took into account lifestyle, gender, age, education and dietary factors including coffee, tea, alcohol, fruit and vegetable intakes. “Given the growing body of evidence, including our own study, cocoa-based products may represent an additional dietary recommendation to improve cardio-metabolic health; however, observational results need to be supported by robust trial evidence. Potential applications of this knowledge include recommendations by healthcare professionals to encourage individuals to consume a wide range of phytochemical-rich foods, which can include dark chocolate in moderate amounts. The study was published in the British Journal of Nutrition (Alkerwi et al., 2016).